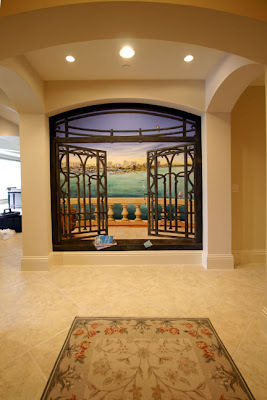 This latest project was installed in a condo at the Labella Sara condo on Golden Gate Point in downtown Sarasota. It's approximately 7' x 7' and was painted on canvas and installed onsite. I added several details after installation. It's basically a decorative iron gate beyond which is a stone balustrade, all overlooking a view of Sarasota Bay. As usual, I personalized the mural somewhat with the stack of books....well....the titles all had something to do with the client or the mural. And the everpresent red string is there as well.